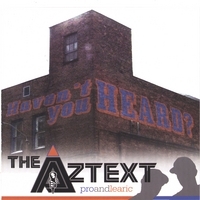 The Aztext are exactly what hip hop has been waiting for... Lyrical, thoughtful, energetic. With features from Krumb Snatcha, Wordsworth, Q-Unique and others... You know 'Haven't You Heard?' was destined to make noise . . The Aztext would like to thank anyone who purchases this album for their support! Hip Hop In It's Purest Form! Jazzy, Soulful, Perfect For Summer! Right from the beginning, it's apparent that the listener is in for an audible treat in the debut opus from The Aztext. It's True is the jumpoff, a Special Weapon-LACED(! ), piano-lead track with a bassline that would make Primo envious. Referencing a mosaic of legendary & classic hip hop artists, songs & albums, Learic & Pro tell personal accounts of their evolution as emcees, making it obvious that they've been at this for awhile and won't be denied success. The rest of the album doesn't let up. Every song shows the lyrical & musical versatility of seasoned veterans. Producers Dub Sonata, Special Weapon, The Loyalists (E-Train & Touchphonics) & D Rapp come correct on each & every song. Appearances from well-known industry veterans Krumbsnatcha, Wordsworth, Q-Unique (formerly of The Arsonists), freestyle legend Double AB, and The Loyalists. My personal favorite song features only the group, showcasing a menacing & haunting backdrop, provided by E-Train, and lyrical mastery by the duo. The song is The Ultimate Tag Team. I think Pro sums it up well when he said, "Now I been everywhere from cocky to asking why rhyme, but I'm done playin' the sideline, this is now our time!" You can literally feel the effort this group has put forth to get to this point, as well as the passion they have for what they do. I like this song the most because, though not as much of a banger as most of the other tracks, it lures you in. You can close your eyes and envision the pictures these artists paint. It's personally hard for me to maintain attention for a full album. If a song doesn't hold my attention with both lyrics and great production, I lose interest very quickly. I can't stop listening to this album. I rock it when I work out. I rock it when I'm riding around. I'm rocking it now. If you have a true love for hip hop music, culture, and history, this album is a must have. If you appreciate a brilliant emcee rocking the mic with ease, you'll love this album. If you like innovative, funky, visual beats over which said emcees rock said mic; if you like remarkable turntablism displayed at it's finest, this is your album.